Well, the first book in the series of how to cope with chronic fatigue syndrome using proven therapies is now online at Amazon! 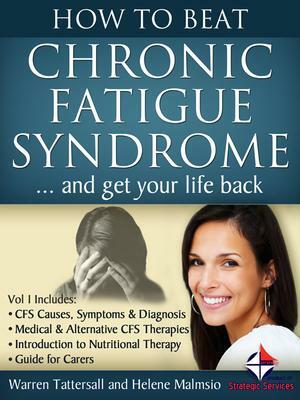 "How to Beat Chronic Fatigue Syndrome...and get your life back!" In this book we are giving you tools to be able to confirm if your symptoms match the common CFS indicators, and if they do, how you can get on with the job of beating your chronic fatigue. This purpose of this book is to give an overview of the whole range of available CFS therapies and to talk though all the treatment choices with you. It will look at the current state of medical thinking, and show you how to find the medical and alternative practitioners that are skilled in treating CFS. It will help you to review the therapies that have already worked for others, make your selection of what resonates with your condition and lifestyle, and translate those strategies into your own individual therapy plan. We also want you to be able assist the people around you to gain some understanding of the condition, so that they can be fully supportive in your CFS management and recovery process. Although we are not medical practitioners, we have spent decades sharing our personal experiences of beating CFS, toward helping other people to deal with their CFS symptoms as well. We are in the process of writing a second book, a companion volume 2 to this, which is dedicated to the benefits of adding Super Foods to your daily diet and incorporating specific herbal based nutritional supplements to your CFS Diet therapy. And then you can come back to our How to Treat Chronic fatigue syndrome CFS section on this site!